I've been very busy over the past week, so I haven't been able to write a new review. I have 2 full days of travel ahead of me tomorrow, so I might not be able to get a review posted any time soon, and since it's been now over a week since my last post I thought, some of you might be interested in some old photos I took prior to starting writing this blog. If anyone enjoys these, I can continue to dig some out from my old archives and continue to post them here, just let me know on Twitter, or even on Instagram. 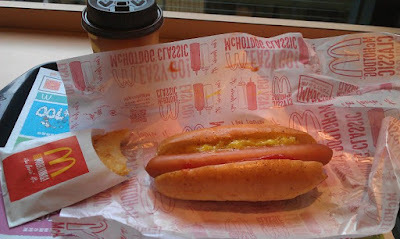 The photo above was a McHotDog breakfast item that I was first able to try in July 2011 from a McDonald's in Yokohama Japan. McHotDogs used to be a regular menu item and have since been discontinued. I also reviewed a limited edition version McHotDog Chilli a couple months later, which happened to be one of the first reviews on this blog. To see more of these old photos, click the link below. 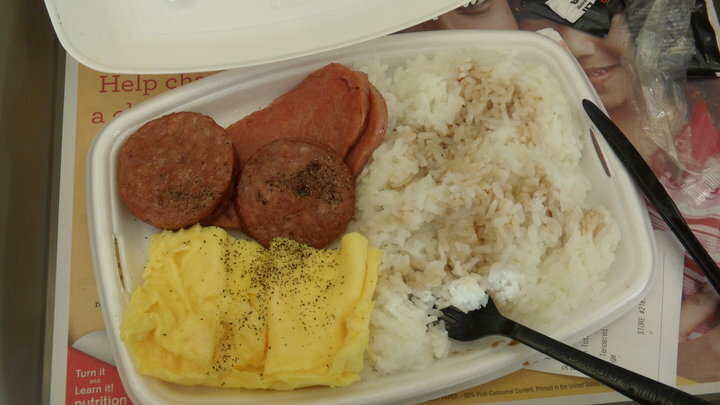 Portuguese Sausage, SPAM, Rice + Egg for Breakfast. Something you can still, and only get in Hawaii. The Lemon Pepper Chicken burger is something that popped up on the limited time menu in Japan a few times in 2009-2010. I remember I tried it this time, didn't really like it and was very disappointed one return trip that it was being offered again. 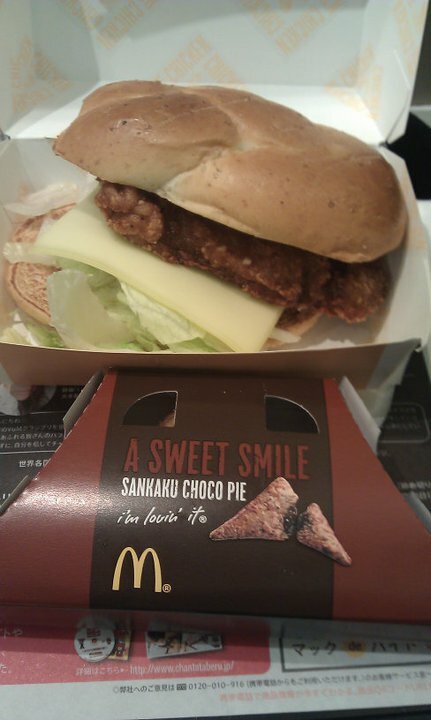 Triangle Pies used to be all the rage as well, pretty much every "promo" pie was a Triangle, but they disappeared from 2012-2015, only to recently reappear with the Hokkaido Milk Pie that I reviewed earlier this year. 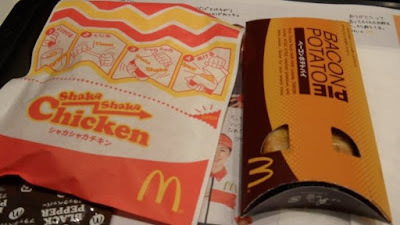 Shaka Shaka Chicken is still a thing in Japan, even though Fry Shakers have become far more popular in recent years. The idea is the same, you flavour your chicken patty with a packet of seasoning. This time I ordered Black Pepper, which in retrospect is a pretty boring flavour as you can always get pepper! The Bacon Potato Pie however I have a note on my Facebook page from back then "Very Gross". Before I moved to Korea in 2009, this was the first meal I tried there when visiting in 2008. 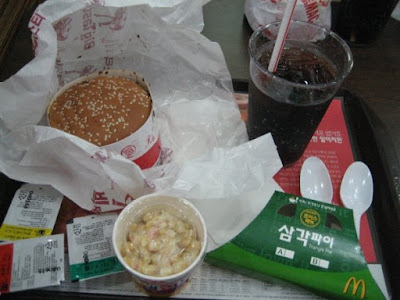 The Bulgogi Burger is still on the menu, but has since lost it's centre Big Mac style bun. The plastic cups are still around for the lunch time rush, but both Pasta Salad and Triangle Pies have completely disappeared. 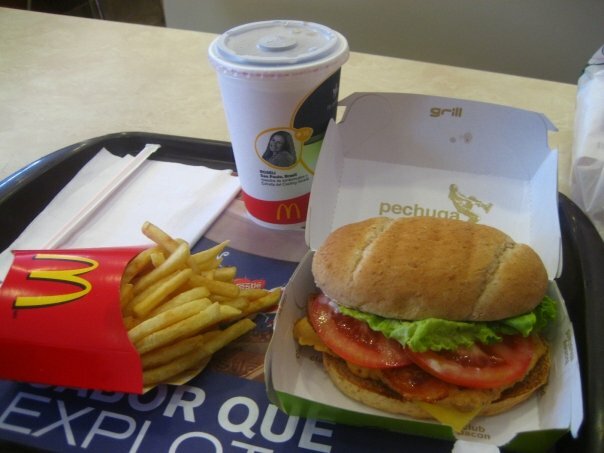 This was also the first, and last time I had Pasta Salad at McDonald's. I did however choose a bit better in Egypt later in the year. Fish Fingers have popped up in Bangladesh of all places, but not really anywhere else that I've noticed (excluding Fish McBites). Before McDonald's rolled Poutine out Canada-wide (in 2014? 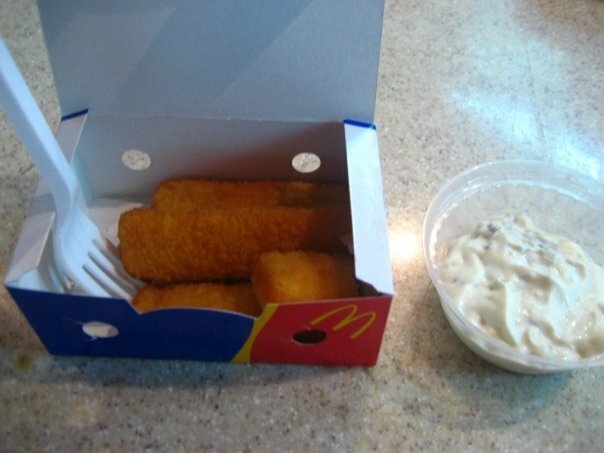 ), they used to only be available in Quebec, and I was able to try it on a visit in 2008. 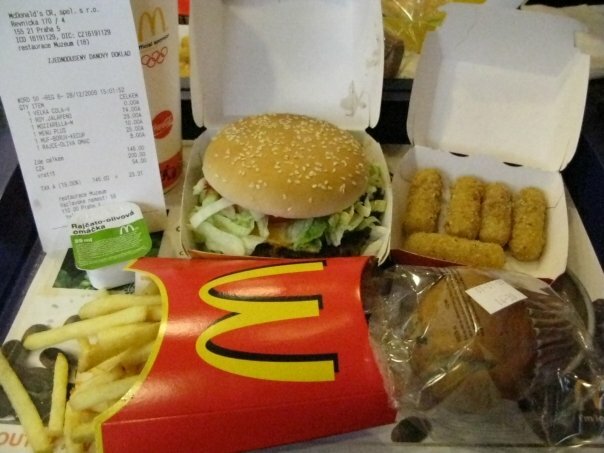 I remember the fries being far too thin to be enjoyable, but they did really load it up with cheese, you can even see it in the photo! 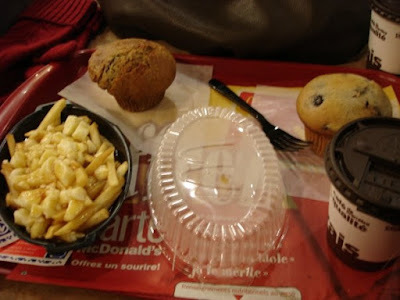 Why Poutine and Muffins you might ask? That's because in Canada they used to have a Small Coffee + Muffin "deal" that was ~ 10 cents more than just a coffee. I saved those for breakfast. 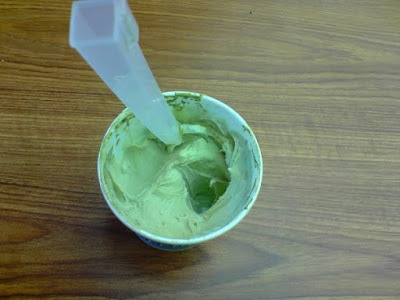 I know I've talked about this one before, but Green Tea McFlurries used to be on the regular menu in Korea and were discontinued shortly after I moved there in 2009, so this photo was at the very end of it's run. I remember them being very popular, so they must have been cut for cost considerations rather than lack of demand. I remember them being quite good as well. During my first, and since only visit to Qatar (but heading there next month!) 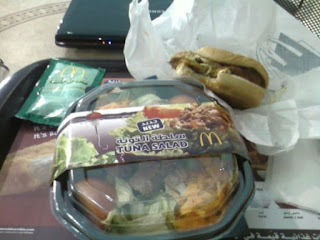 I tried the new at the time, Tuna Salad. A Veggie Burger in the Middle East was new to me as well, so I gave that a try. Can't really remember much about this one. Really Hong Kong? 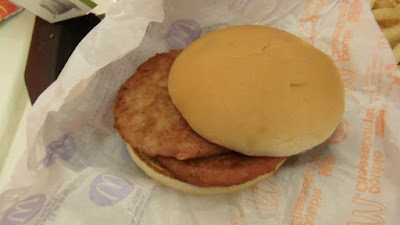 2 Sausage Patties between a Hamburger bun and you call this a promo burger? I can give it a 0/5 review just by looking at this photo. I have at least 50 more photos like this worth posting, so really do let me know if you like this feature and I'll be sure to post more!